Reduced! If there was a Model Home in Greenbrook, this would be it! 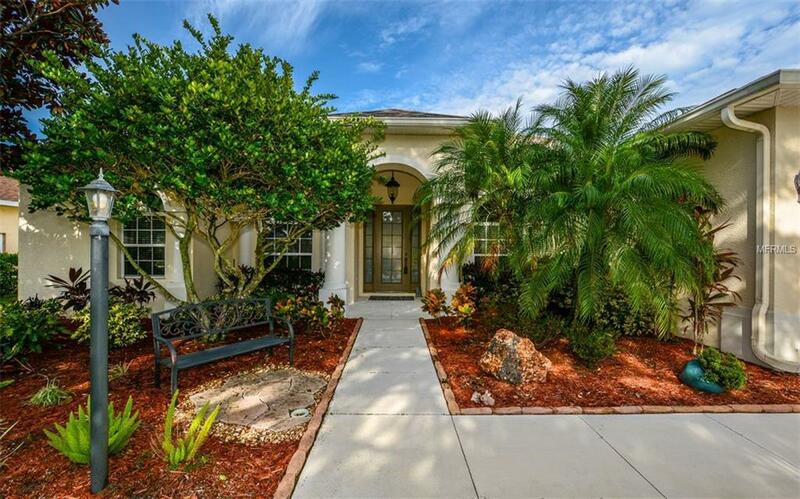 Move in ready, immaculate home with brand new AC feels like your own private resort. High ceilings, crown molding and an elegant dining room flanked by 10' columns complete its charm. Family and friends will gather around the saltwater pool with its 2 covered lanais, while you entertain for 2 or 20 in the open kitchen with a chef's island and stainless appliances. Slide open the patio doors and they completely disappear bringing the outdoors right into the family room. Your friends will gather around the built-in entertainment center on Super Bowl Sunday, dipping chips into salsa while chili simmers on the stove. After a long day, imagine yourself unwinding in the garden tub while your cares melt away. Or when you need your own quiet space, retire to the intimate den to relax and recharge. Take a sunset walk on the nature area path and watch a great heron as she hunts for her dinner. Ride your bike, run or walk the miles of trails all the way into nearby Summerfield. Just a short walk away, both you and your family will love Adventure Park with its playgrounds, dog park, roller hockey rink and volley ball court. Host a grand get-together for friends under the covered pavilion and pick teams for an evening game in one of the 2 soccer fields. Your home will be both your private oasis and a place your friends and family will enjoy with you. AC is brand new and Stainless steel appliances are only 2 years old! Furnishings available. Additional Lease Restrictions See Hoa For Detailed Restrictions. Owners Wishing To Lease Their Lots And Units Are Required To Place in Escrow With The Association A Sum Of Up To $1000.00. Pet Restrictions Dogs And Cats Must Be On A Leash And Controlled By An Adult Or Mature Teenager Who Can Handle The Dog Or Cat When Walked. Dogs May Be Confined in A Fenced Rear Yard While The Owner is Home As Long As Dogs Do Not Become A Nuisance To Neighbors.